^ YouTube. Youtube.com. [October 23, 2014]. ^ Fred Bronson: The Billboard Book of Number 1 Hits, page 265. Billboard Books, 2003. ^ 3.0 3.1 3.2 3.3 3.4 Unterberger, Richie. "The Supremes". The Supremes have sold over 100 million records to date. Their catalog remains active 50 years later. Allmusic. Retrieved on July 4, 2008. ^ 4.0 4.1 4.2 4.3 Wilson et al., 29–36. ^ Wilson et al., 53–56. ^ 8.0 8.1 Show 26 - The Soul Reformation: Phase two, the Motown story. [Part 5]. ^ 10.0 10.1 Wilson et al., 69–71. 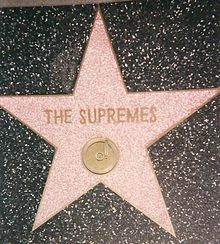 ^ 17.0 17.1 "The Supremes". The Rock and Roll Hall of Fame and Museum, 1988. Retrieved on July 21, 2008. ^ 22.0 22.1 Wilson et al., 141–143. ^ "The Grammy Hall Of Fame Award". grammy.com. Retrieved on July 24, 2008. ^ "The Supremes become the first all-female band to have a No.1 hit album 互联网档案馆的存檔，存档日期2008-10-03.". National Arts and Education Network. Retrieved on July 17, 2008. ^ Leigh, Wendy. "Queen of the Supremes before Diana Ross". Daily Mail, May 22, 2008. Retrieved on August 4, 2008. ^ Show 50 – The Soul Reformation: Phase three, soul music at the summit. [Part 6] : UNT Digital Library. UNT Digital Library. [October 23, 2014]. ^ 36.0 36.1 Yusuf, Nilgin. "The Supremes on show". Telegraph (UK), April 26, 2008. Retrieved on August 4, 2008. ^ Ebony 1965, p. 86. ^ Skurow, Andrew.The Supremes (2000 album). CD boxed set liner notes appendix, 2007. New York: Motown Record Co./Universal Music. ^ "Grammy Hall of Fame Awards". Grammy.com, 2007. Retrieved April 27, 2007. ^ "The Rock and Roll Hall of Fame's 500 Songs That Shaped Rock and Roll (by artist) 互联网档案馆的存檔，存档日期2007-05-14.". Rock and Roll Hall of Fame, 2007. Retrieved on April 27, 2007. 存档副本. [2008-03-14]. （原始内容存档于2007-05-14）.